Bochum-based researchers are aiming to make construction sites safer with interactive virtual reality training courses. The team led by Prof Dr Markus König from the Institute for Computation in Engineering at the Ruhr-Universität Bochum is developing suitable technology to make it possible to experience sources of danger virtually. It is intended to help occupational health and safety experts to check construction sites for critical areas in advance and plan suitable safety measures. Construction workers could also be trained in virtual reality and sensitised to dangers. The science magazine Rubin at the Ruhr-Universität reports. The researchers are making the most of the fact that every large construction site today is first planned virtually before it is created for real. They can use these three-dimensional models as the basis for their representation in virtual reality (VR). They are using the same technology as found in computer games to ensure that the environment looks as realistic as possible. 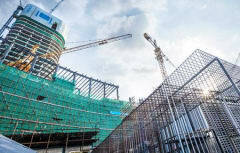 With the aid of VR glasses, the users can thus explore the construction sites for which they will later be responsible. They can interact with the environment, such as lifting and carrying objects, using controllers. PhD student Thomas Hilfert is working on automatically creating virtual environments using three-dimensional models. Based on a modular concept, construction machines could be added with suitable sounds in order to create a virtual construction site to suit individual needs. Hilfert has already completed construction sites with various layouts, which test subjects can explore in rain, fog or sunshine. Together with their colleague Dr Jochen Teizer, safety expert for the construction industry, König and Hilfert want to evaluate their development with research subjects as a next step. “As you have an unlimited number of lives in virtual reality, we can observe there precisely how the test subjects react before and after fatal accidents and when learning effects come in,” explains Hilfert. There are many accidents on German construction sites each year. “The cause of an accident is often not misconduct by a single worker but rather a lack of a safety culture in the company or insufficient requirements for safe working conditions,” says Jochen Teizer. Numerous construction companies from Germany and abroad have already expressed interest in the Bochum technology.